Letting things go does not mean to get rid of them. Letting them go means to let them. E veryone knows the feeling when you hold on to something that lies in the past or has been lost. I’m not talking about bittersweet memories of moments long gone or keeping something to commemorate something that is important to us. I mean situations where we hold on helplessly or desperately cling to bygones although we feel that they cause nothing but sorrow – and somehow we don’t seem to have any influence on this act of holding on. Friends, who wish us well, and other advisors tell us to finally let go. To make amends with the fact that some things will never change and others are over. But we already know that. WHY DO WE NOT SUCCEED IN LETTING GO? The answer is simple: because we’re holding on. Most of the time not consciously, since we are frantically trying to let go of the hurt and the pain. Yet here we are confronted with our mind turning the same thoughts over and over again, the inner holding on. Tie a coconut to a tree, hollow it and put some rice in it. The hole in the coconut should just be large enough for a monkey to put its hand in it. The monkey will grasp the rice but meanwhile its hand has gotten so big, that it can’t pull it out anymore. But it wants to hold on to the rice no matter what and thus is captured. What we need to realize is: We subconsciously hold on to something, because we fear something would happen, if we were to take the risk of letting go. Identify that fear. That may not be easy because you will find all sorts of reasons why you needn’t be afraid of anything. Here’s a well-proven method of how you can begin with letting go. Identify the matter or incident or the feeling which keeps rising to the surface although it is unwanted. It may turn out to be something that goes way back, maybe all the way back to your childhood or youth. It may just as well be something that occurred only recently. Perhaps it is a single incident or something that you’ve encountered over and over or a specific time in your life. Attentively pay attention to what it is exactly that puts a strain on you in this context and write it down. – Writing it down is a crucial point, because having the same thing turn in your head does not have the same effect. Writing liberates you. Especially when you write in an unfiltered manner. It empties your “worry and emotion tank“ pretty quickly. – Note all items that occupy your mind in the matter. You can even make a whole long list. – Above all just start writing…without sorting everything out first…everything that comes to mind….it doesn’t have to make any sense….just keep on writing…what preoccupies you in the matter….thoughts…emotions…incidents….just keep writing them down one after another. – Continue writing until you feel you’ve reached new clarity, a special form of inner peace. After a while take a look at everything that you wrote from item 2 on. Now it’s time to recognize the inner conflict why you weren’t able to let the matter go until now. Often it’s some kind of fear about what might happen, if you let go or a fact that you haven’t been able to accept so far. I’ve made a list of examples for you further below in this article. How will you know you’ve let the matter go? – Again you need to write down what you will do once you’ve let go of the thought, the worry, the incident. – By letting go you will experience new space concerning your thinking, your emotions, your actions and your entire life. – What would you like to do with this free space? Write all that down. You cannot force yourself to let something go. And when you let something go you have to give something away. Yet it’s often not what you think you’ve lost. You need to let go the reason for your holding on. But in order to do that you have to recognize what that particular reason is. Which fears can block the process of letting go? When we hold on to something that is eternally lost, then there is almost always a good reason with which we want to safeguard something inside of us. It’s all about finding this particular reason. A freelancer once told me during a therapy session, that he went bankrupt fifteen years ago and since then has been caught up in an undesired, low paid job as an employee. He said that he has good ideas to open up a new business but as soon he preoccupies his mind with the thought he immediately loses his courage because the image of the bankruptcy appears before his mind’s eye. – that he had enough to live on and that more money wouldn’t make him any happier either. After having written down all these reasons that were totally unknown to him, he was able to judge them from a distance. He remarked that they all had some sort of punishing quality and that reminded him of his strict Catholic upbringing. As he gained clarity on the background of his holding on, he was enabled to look upon his fears more rationally and could classify them as inappropriate. A half year later he went into business for himself with a brand new idea. Our holding on to meaningless thoughts, exaggerated fears, undesired experiences has a function, a deeper meaning. Mostly we try to keep a fear in check or don’t want to accept a painful truth. There were parents who kept their son’s room in its original state although the son had died 30 years before. In this case it’s often the overwhelming fear of feelings of guilt that would emerge. Maybe one parent believes to be guilty and that he or she could have prevented the son from dying. Sometimes it’s an extremely strong loyalty that makes a person feel as if they were betraying the deceased person, if they were to return back to a normal life and were happy and content. You keep having feelings of guilt in a matter where rationally you are aware that it was not your fault. Usually a strong superego or merciless inner critic is at work here. One that wants to make you feel bad about your failures for an eternity. Forgiving yourself or seeing that you have no fault seems to be nothing but a cheap excuse. A manager keeps quarreling with himself why he had never taken the opportunity to go abroad after having finished university, since that would have provided him with better career options. That person does not want to accept that his safety thinking was his priority and that taking a risk was not an option back then. When I suggested to him to be courageous now and take a risk he had to acknowledge, that he was not the type and that safety thinking came first. A woman stays in her unsatisfying marriage that basically only exists on a piece of paper. Her conviction was that she would not find a better partner because she hadn’t earned one. The reason? She once betrayed her husband at the beginning of their relationship and figured she had to atone for this behavior. A mistake you made years ago keeps coming to your mind. Frequently the conflict here has to do with someone believing that only normal people make mistakes but that one is somehow better than the rest and thus should be flawless. Forgiving oneself for the mistake is then not perceived as a relief but considered to be evidence that one actually isn’t better than others. A forty year-old has been collecting and keeping all newspapers, magazines and glossies for years and years. 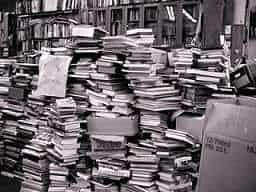 There was no way he’d ever be able to read them all and therefore he moved to a bigger apartment. It’s the attempt not to face finiteness. He became aware, that if he were to throw away a five year old stack of newspapers, he would never own them again in his life. A man cannot get over the death of his spouse that happened ten years ago and remains in hollow resignation. Accepting the death of a beloved person always has an impact on one’s own mortality. Bearing in mind that there is a limited time to life. If a person believes that he or she cannot bear the thought of this truth, then often he or she refuses to take active part in life because it seems to them there is no value to it regarding the certainty of death itself. Letting go means to accept something. In order to finally let go of past grievances, old injuries, faded love, failed trials you usually have to learn to accept something. The refusal to accept leads to holding on which shows itself through endless pondering or agonizing, recurring same old thoughts. When you’ve spotted the reason for your holding on, the meaning that you’ve given the matter until now by having written everything down as described earlier, then you will probably also find the key of how you can let it all go. Accepting, that life can be unfair. Accepting, that there is no deeper meaning to something awful that happened. Accepting, that life, destiny or God don’t punish. Accepting, that things don’t always go your way and that you’re not permanently right. Accepting, that everything in life is limited and gets its value through this fact. Accepting, that you’re not a special person who can expect to be treated exceptionally. Accepting, that life also offers sorrow. Accepting, that there is no „good“ and „bad“ but that this evaluation always lies within the eye of the beholder. Accepting, that there is also no „right“ or „wrong“ but that this always depends on the perspective. Sometimes we need to accept that before the big profit comes our way there is relinquishment. If we really want to change something, then we need to give something else away. That this can be pretty tough is something I am quite aware of – – I gave away part of my cherished book collection – one thousand (!) in numbers. But holding on sometimes seems to be easier than letting go. What experiences have you gone trough on the topic of letting go? The Sedona-method®: Four questions that make a change! ← Dialogues that make a difference – how couples manage to talk about themselves and with each other.